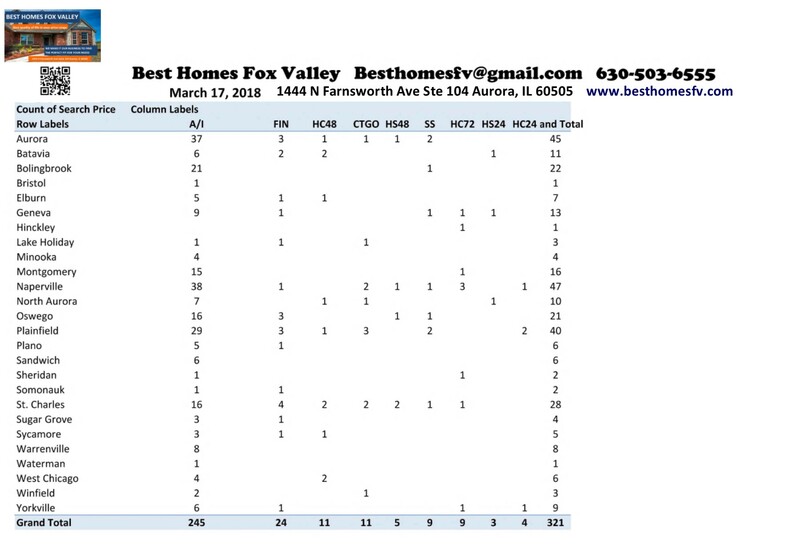 Market update Fox Valley-March 16 2019. Spring market is picking up steam. 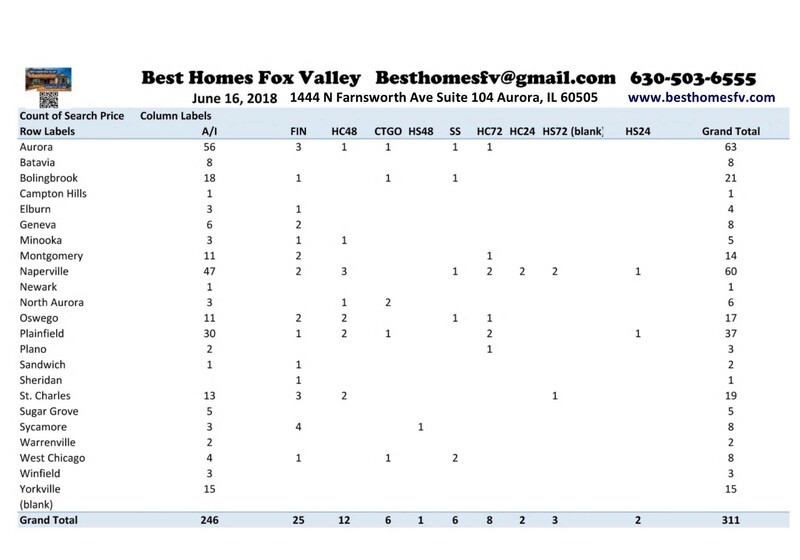 350 new listings of homes this week compared to 327 last week. You can see the difference when you look at it by the month. We still have 2 more weeks to go in March and we are almost to February numbers this week. Closed homes this week were also up this week. 166 this week compared to 131 last week. January and February started out pretty slow but we are picking up now. We have already passed up the totals for the first two months of the year and we are not finished with March yet. Contracts accepted were up slightly this week. 283 this week compared to 267 last week. More new listings coming on the market will increase these numbers as this month moves along. Take a look at the totals for each month so far. We are not done with March yet so we will exceed the totals for the months so far. Short sales this week were similar to the week before. 9 this week compared to 8 last week. 4 were in Naperville this week, 2 in Aurora and 1 each in Bolingbrook, Plano and Yorkville. Sellers accepted contracts this week that are contingent on the Buyer closing on their current home. 9 with a kick-out clause of 72 hours, 6 with 24 hours and 4 with 24 hours. Contracts were also accepted by Sellers that the Buyer still has to sell their current home and close before purchasing. 3 with a kick-out clause of 72 hours and 4 with 48 hours. Give us a call at 630-503-6555 with all of your real estate questions. Jeffery Szymczak-Broker ext 104, Bobby Burson-Broker ext 105 or Kristine Heiman-Managing Broker. Our goal is to negotiate price and terms that are best whether you are selling or buying a home. If you are thinking about selling this year now is the time to get it on the market. Spring market is the best time to sell. We can update the value of your home in the current market. Provide you with a net proceeds so you can see the expenses to sell. This will be updated when an offer comes in and we know all the terms. Thinking about buying? Your first step is to contact a loan officer and find out what price range and type of loan will workout best for you. They will provide you with a letter that we need to put with an offer to show the Seller that you qualify for their home. 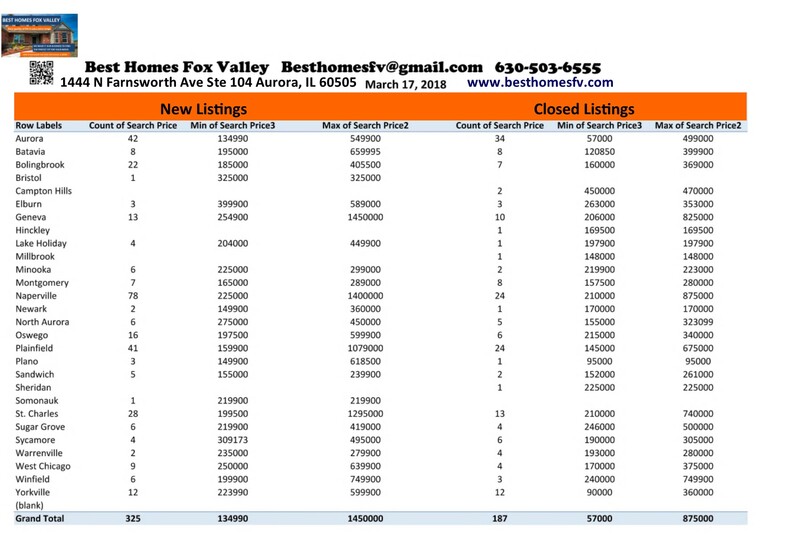 Market update Fox Valley-March 16 2019. Have a great week! 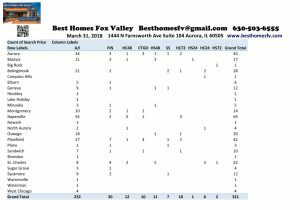 Best Homes Fox Valley-Search for homes today! New search tool here. You can see where a home is located within a block or subdivision. A birds eye view. 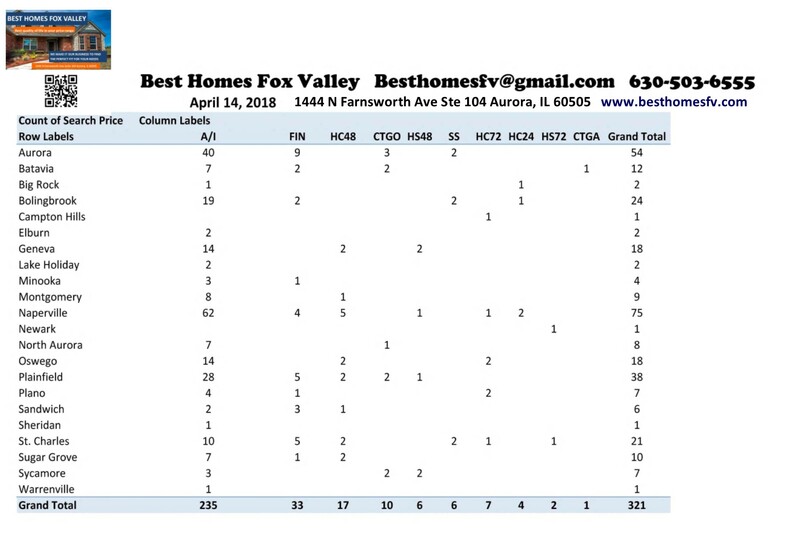 Market update Fox Valley-December 1 2018. Definitely an increase in new listings this week! 156 this week compared to 90 last week. Last week was a holiday week so it was a short week. Next week will be our first full week of December. The last month of the year. It is time to start thinking about next year. If you are thinking about selling in 2019 now is the time to start planning. You might even want to ask for certain things for gifts to help with fixing something up or replacing something to spruce it up. Closing this week were also up. 180 this week compared to 122 last week. This week was the last full week of the month which is always busy. This next month should be a repeat of this month with a holiday at the end of the month and everyone wanting to close at the end of the month and also the end of the year. Contracts accepted this week by Sellers were down this week. 128 this week compared to 137 last week. If you are not from the area last Sunday we had heavy wet snow that I think slowed things down for the beginning of the week. People were out of power Sunday night into Monday and some even longer than that. Short sales accepted this week were the same as last week. 2 were accepted both weeks. Now they will be submitted to the lender to see if they will also accept contract as written. Contracts were accepted by Sellers that are contingent on the Buyers closing on their current home before the can purchase. 2 with a kick-out clause of 72 hours, 9 with 48 hours and 1 with 24 hours. Sellers also accepted contracts that are contingent of the sale and closing on the Buyers current home. 1 each with a kick-out clause of 72, 48 and 24 hours. Let us update your home value and provide you with a net proceeds so you have an estimate of expenses. This will be updated when an offer comes in and we know all the terms so you can make a decision. Buyers need to get pre-qualified to begin looking at houses. The loan officer will provide them with a letter that will go with an offer when they find a home. This needs to be within the last 30 days or it will have to be updated. Let us know what real estate questions that you have. 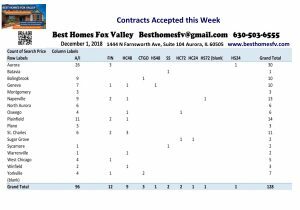 Market update Fox Valley-December 1 2018. Have a great week! Market update Fox Valley-November 17 2018. 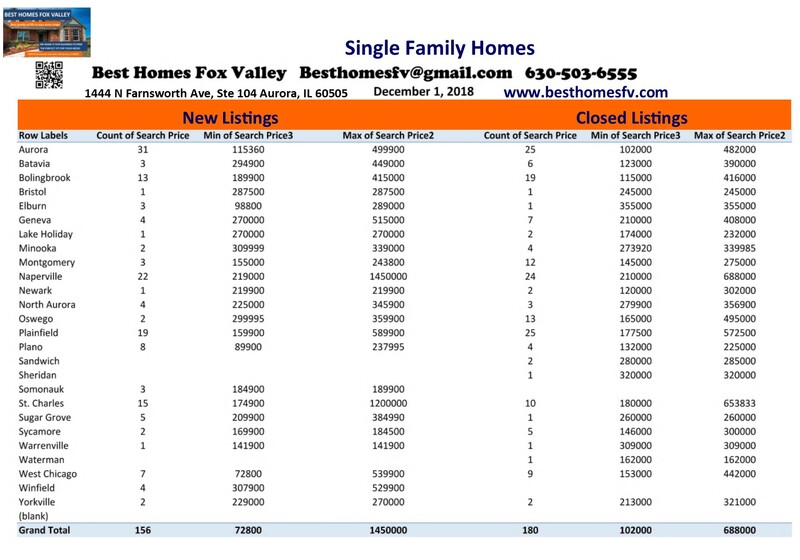 New listings this week were consistent with last week. 199 this week compared to 221 last week. No this is not Spring market but we are staying consistent so that is good! It is a good time to sell without all the competition. The most important thing is to be priced right for condition and location. Closed homes this week were up. 204 closed this week compared to 151 last week. We are getting closer to the end of the month and also a holiday so that is to be expected. Contracts accepted by Sellers this week were slightly down. 171 this week compared to 188 last week. The market has slowed down but it really has been pretty consistent since the beginning of September. Some weeks are slightly higher some lower but within the same range. Short sales accepted this week were the same as last week. 6 both weeks just different communities. 1 was accepted in Aurora, Montgomery, Oswego, St Charles/Campton Hills and 2 in Yorkville. Now they will be submitted to the lender to see if they will also accept as written. If a contract is cash there is usually contingencies of home inspection and attorney review. Other contracts are also contingent on the Buyer obtaining financing. Some Buyers have a home already. They have to add a contingency on their home closing before purchasing if they have already accepted an contract on their current home. This week 5 added a kick-out clause of 48 hours and 1 with 24 hours. Other Buyers have not sold their current home yet so they had to add a contingency of selling and closing on their current home. 3 this week with a kick-out clause of 72 hours and 5 with 48 hours. We know this can all be confusing especially if it is your first time or it has been a while since the last time you bought or sold a home. Request an updated market analysis so you know what your home is worth in the current market. You will be provided a net proceeds that shows an estimate of expenses to sell your home. This will be updated when an offer comes in and we know all the terms so you can make a decision to accept, reject or counter. We can recommend a few real estate attorneys, loan officers and home inspectors that we have worked with so you can decide who is best for you to work with. Market Update Fox Valley-November 17 2018. Have a great week! 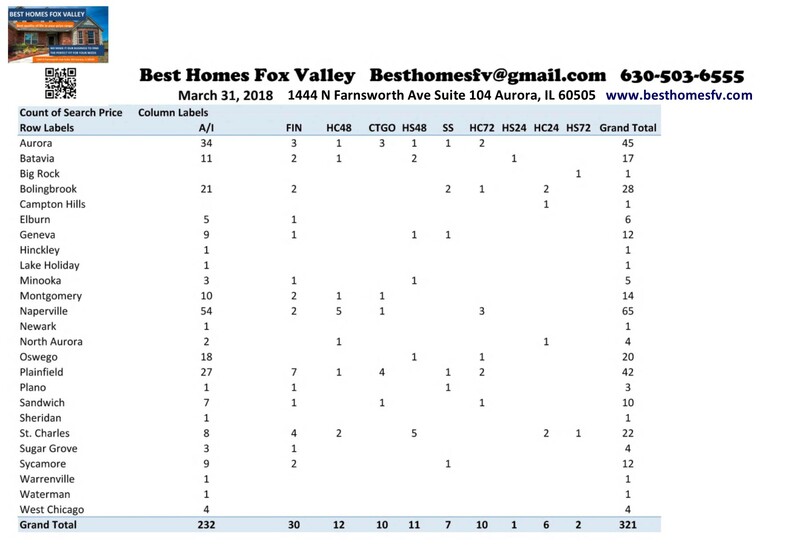 Market update Fox Valley-November 10 2018. New listings of Single-Family homes were pretty consistent. 221 this week compared to 219 last week. There is still time to get into a new home before the end of the year. Closed listings this week were down. 151 this week compared to 262 last week. That is the difference between end of the month and the beginning. Most Buyers want to close at the end of the month. 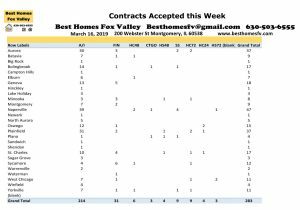 Contracts accepted this week were slightly higher than last week. 188 this week compared to 157 last week. Buyers are still out there looking for the best home for their price range. Short sales still remain low. 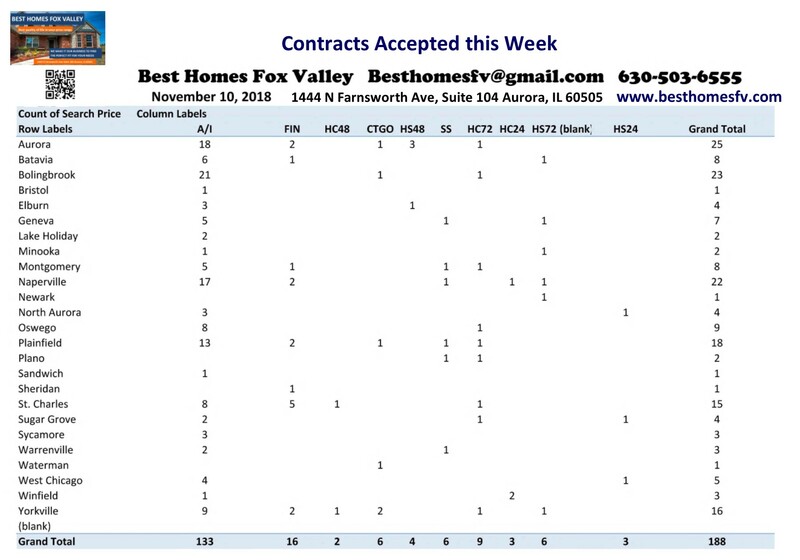 6 contracts accepted this week compared to 3 last week. Now they will be submitted to the lender to see if they will also accept as written. Geneva, Montgomery, Naperville, Plainfield, Plano and Warrenville each accepted 1 short sale this week by the Sellers. Sellers accepted contracts this week that are contingent on the Buyer closing on their current home. 9 with a kick-out clause of 72 hours, 2 with 48 hours and 3 with 24 hours. Contingencies on the sale and close of the Buyers current home were also accepted by Sellers. 6 with a kick-out clause of 72 hours, 4 with 48 hours and 3 with 24 hours. We can update the value of your home in the current market and provide you with a net proceeds so you have an estimate of expenses. This will be updated when an offer comes in and we know all the terms. Thinking about buying? You will need to contact a loan officer to get pre-qualified. They will provide you with a letter showing what you qualify for that will go with an offer when you find a home. This should be no older than 30 days. Market update Fox Valley-November 10 2018. Have a great week! Market Update Fox Valley-July 14 2018. New listings are way up this week! 407 this week compared to 262 last week. Making up for the holiday short week. Sellers held off to list until after the holiday. This is great news for buyers! Closings were slightly up from last week. 240 this week compared to 204 last week during the holiday week. It is also the beginning of the month so the numbers are going to be down. We will see them go up as the month continues. In most communities this week the active listings went up. We will have to keep an eye on that to see if it is just after the holiday week or if things are starting to slow down. 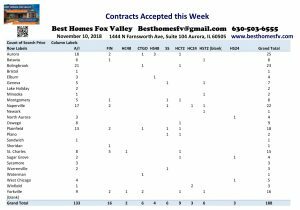 Contracts accepted this week were up. 264 this week compared to 243 last week. We hope next week these numbers are even better. July is usually the month that many people head out for vacations. Sometimes things slow down and pick back up in August. We are still seeing multiple offer situations so maybe things will keep humming along. Short sales were up slightly this week. 7 this week compared to 3 last week. They are still low in number so that is a great thing. Now they will be submitted to the lender to see if they will also accept that as written. Sellers accepted contracts this week that are contingent on the closing of the buyers current home. The buyers already have a contract on their home but need to close before purchasing. 9 with a kick-out clause of 72 hours, 12 with 48 hours and 1 with 24 hours. Contracts were also accepted by sellers that the buyer still needs to sell their current home and close before purchasing.They might or might not already have their home on the market. 4 with a kick-out clause of 72 hours and 4 with 48 hours. Call us at 630-503-6555 Jeffery Szymczak-Broker ext 104, Bobby Burson-Broker ext 104 or Kristine Heiman-Managing Broker ext 101. Our goal is to negotiate price and terms that are best. We will let you know the current value of your home in today’s market. Provide you with a net proceeds so you can see the costs to sell. Let you know the best things to do to get your home market ready. If you are thinking about purchasing your first step is to talk to a loan officer to get pre-qualified so you know what price range you should look in and if you need to work on your credit score. Find out what type of loan will work out best for you so you know what properties will work for the type of financing you will be going for. Look up current interest rates. Your credit score will determine what interest rate you might be offered. Check to see if you qualify for down payment assistance. Everyone should look and also ask your loan officer what they do to help with your costs. Illinois also offers a few programs you should take a look at. If you are a veteran and are looking for information about VA loans. See what the requirements are the process. 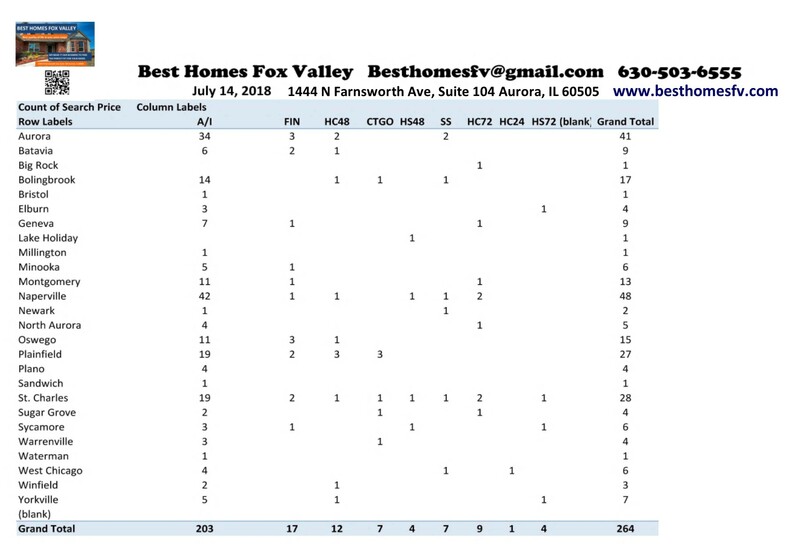 Market update Fox Valley-July 14 2018. Have a great week! 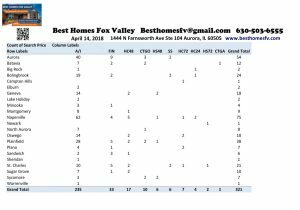 Market Update Fox Valley-June 16 2018. New listings this week were slightly less then last week. 375 this week compared to 387 last week. We still are not quenching the thirst for the buyers out there still looking. It is still a great time to be a seller! Closed listings this week were slightly higher than the week before. 326 closings this week compared to 295 last week. These numbers will get higher as we head into the end of the month. Contracts accepted this week were almost even this week. 311 this week compared to 303 last week. It is still common to be in a multiple offer situation for buyers. It can be frustrating but you need to keep trying and make your offer as strong as possible so you can win. Short sale contracts accepted this week remain low. 6 this week compared to 4 last week. Sellers accepted contracts this week that are contingent on the buyers current home closing before purchasing. The buyers have already accepted a contract on their current home but need to close first. 8 with a kick-out clause of 72 hours, 12 with 48 hours and 2 with 24 hours. Contracts were also accepted by sellers that the buyer still needs to sell their current home and close before purchasing. They might or might not already have their current home on the market. 3 with a kick-out clause of 72 hours, 1 with 48 hours and 2 with 24 hours. Give us a call at 630-503-6555 Jeffery Szymczak-Broker ext 104, Bobby Burson-Broker ext 105 or Kristine Heiman-Managing Broker et 101. Our goal is to negotiate price and terms that are best. We make it our business to find the perfect fit for your needs. If you are thinking about selling let us update your market analysis so you know the value in the current market. You might be very please with the increase of prices. We will provide you with a net proceeds. This will give you an estimate of the costs to sell your home. This will be updated when an offer comes in and we know all the terms. Looking to purchase a home? Your first step is to talk to a loan officer to get pre approved so you know the best price range to look. They will provide you with a pre approval letter that will need to go with an offer when you find a home. You need to see what type of loan that will work for your situation. Learn more about loan and the process. Take a look at the current interest rates. They are talking about raising rates a couple more times yet this year. Raising the rates will affect what you qualify for. You can search and see if you qualify for and assistance with a down payment,. If you are a police officer, fire fighter or veteran you really need to look. Veterans can search information about getting a VA loan. There is some good information there. Market Update Fox Valley-June 16 2018. Have a great week! 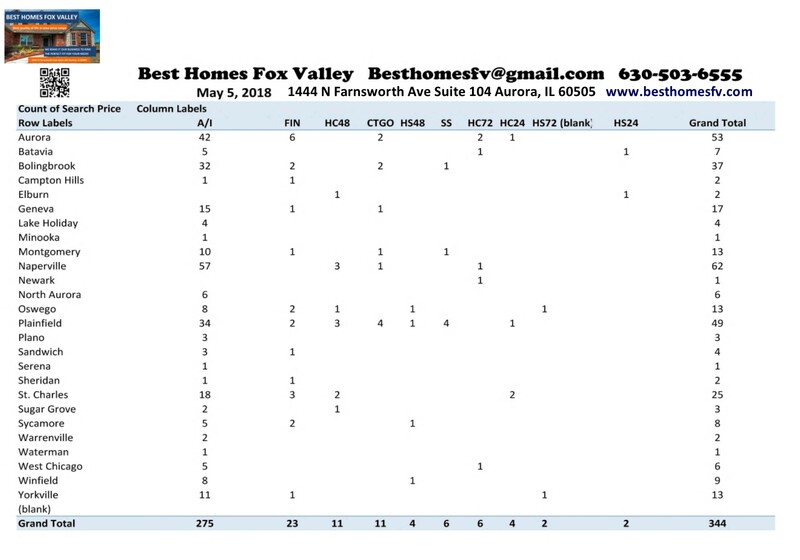 Market Update Fox Valley-May 5 2018. May is starting out on fire! 443 New listings this week compared to 342 last week. Naperville saw 108 New listings, Plainfield 62, Aurora 59 and St Charles 45. Look below at the contingent listings to see how these communities did this week. You can see why the inventory is staying low. As soon as listings come on the market about that many receive contracts. It might not be the new listings under contract but the amount of listings does not increase that much. Buyers are frustrated with dealing with multiple offer situations. New listings are in high demand that are market ready. Closed listings were also up this week. 316 this week compared to 237 the week before. Some of them were on the last day of the month which was Monday. The end of this month should be even better. 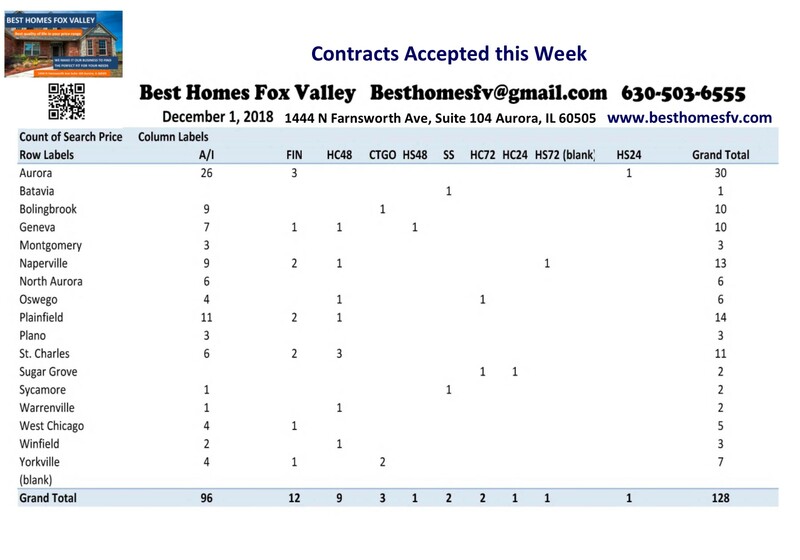 Contracts accepted this week in the Fox Valley were slightly down from the week before. 344 this week compared to 357 last week. These numbers would be higher with more inventory. We need more listings to meet the demand of the buyers that are out there still looking. The ones that stay on the market are either overpriced or need work that the buyers are not willing to do. If you look at the New listings and contracts accepted in the communities that we are tracking you will see that the numbers are close. When the New listings exceed contracts accepted by bigger margins then you will know that we are meeting the demand of the buyers that are out there. Short sales this week were up slightly. 6 this week compared to 2 last week. Now they will be submitted to the lender to see if they will also accept contract as written. Sellers accepted contracts that are contingent on the buyers current home closing. Buyers have already accepted a contract on their home but need to close to purchase. 6 with a kick-out clause of 72 hours, 11 with 48 hours and 4 with 24 hours. Also Sellers accepted contracts that are contingent on the buyer selling their home and closing. Buyers might or might not already have their current home on the market. They have not accepted a contract on their home. The buyer still need to sell it and close before purchasing. 2 with a kick-out clause of 72 hours, 4 with 48 hours and 2 with 24 hours. If you are thinking about selling this year now is the best time of the year. We can do a market analysis on your home so you know the value in the current market. We can tell you what you need to do to get your home market ready. Give you an estimate of what you will walk away with. We will update that when a contract comes in and we know all the terms. Before you start looking at homes to purchase you need to get pre approved with a loan officer. If you need recommendations let us know. Take a look at the different types of loans and the process. That will help you with talking to the loan officer and know what questions to ask. Check to see if you qualify for down payment assistance. Are you a veteran, teacher, firefighter or police officer? Some communities also offer assistance. Go to the website of the community you are wanting to purchase in to see. Look at current interest rates to see where they are right now. Your credit score will determine what interest rate they will offer you. The loan officer will be able to help you with working on improving your score so you get the best interest rate. Give us a call at 630-503-6555 Jeffery Szymczak-Broker ext 104, Bobby Burson-Broker ext 105 or Kristine Heiman-Managing Broker ext 101. Our goal is to negotiate price and terms that are best. We make it our business to find the perfect fit for your needs. 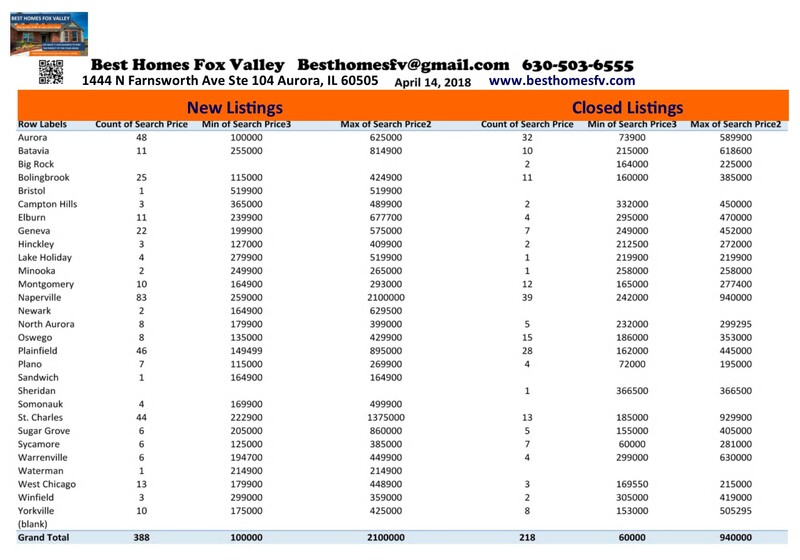 Market update Fox Valley-May 5 2018 Have a great week! 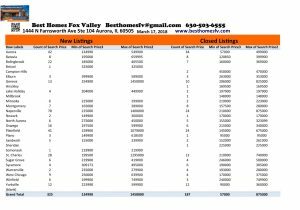 Market update Fox Valley-April 14 2018. New listings were down this week. 388 this week compared to 450 last week. It has been a varied weather week with snow on Monday and then 70’s on Wednesday. We are supposed to have snow again this Monday. Are you waiting for the nice weather? Buyers are not waiting. They are actively looking for homes so there is no reason to wait. Homes that closed this week were up. 218 this week compared to 176 last week. That is unusual for the beginning of the month. Usually it is lower and then starts building in numbers heading into the end of the month. Ask us about private listings. Some properties do not want to be listed publicly and others they have them in the private listing while they are getting them ready for market. Some we can show and they have a price listed and then others have no price and can not be shown before listing date. They are just letting you know that the listing is coming soon. 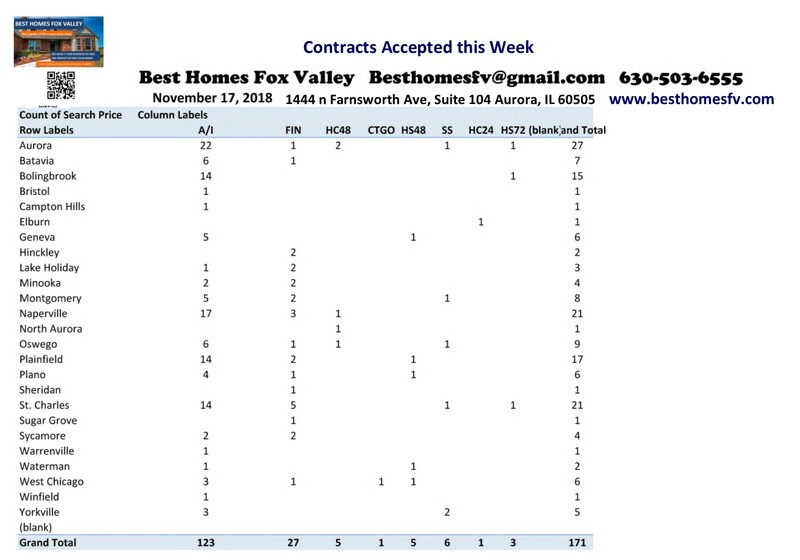 Contracts accepted this week from sellers were up this week. 321 this week compared to 279 last week. We need new listings to replace these that are now off the market. Buyers are actively looking for homes. Now is the time if you are thinking about selling this year. Short Sales this week were exactly the same as last week with 6 contracts accepted by sellers. Now they will be submitted to the lender to see if they will also accept as written. Sellers accepted contracts with the contingency of the buyers home closing. Buyers have already accepted a contract on their home but need to close before purchasing. 7 with a 72 hour kick-out clause, 17 with 48 hours and 4 with 24 hours. Contracts were also accepted by sellers with a contingency on the buyers home selling and closing. Buyers current home might or might not already be on the market. They have not accepted a contract on their home. They need to sell their current home and close before purchasing. 2 with a 72 hour kick-out clause and 6 with 48 hours. If you are thinking about selling your home you will need a market analysis to let you know the value in the current market. Pricing your home right from the beginning is very important. If you overprice your home it will sit and will not sell. Testing the market is not wise. Buyers are pretty savvy. They are looking for the best value and are looking and comparing. Thinking about purchasing? You will first need to contact a loan officer and get pre-approved. They will provide you with a letter showing what you qualify for. That will need to go with an offer when you find a home. You can find out about the different types of loans and the process so when you contact a loan officer you know what questions to ask. Check out down payment assistance to see if you qualify. Once you know what you qualify for talk to your lender. Sometimes they also offer help. Take a look at interest rates. Your credit score will determine what interest rate you get. Your loan officer can help you work on your score if there are things you can do to bring it up. Look at school ratings. Whether you have kids or not buying in a good school district will help you with value when you go to sell your home. Market update Fox Valley-April 14 2018. Have a great week! 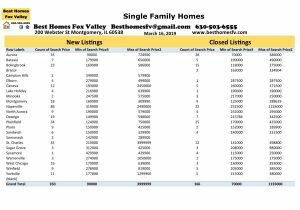 Market update Fox Valley-March 31, 2018. New listings were down this week. 227 this week compared to 324 last week. It is a holiday week. We should get back to normal next week. April should be a good month for new listings. Closed listings were up this week. 221 this week compared to 182 last week. It is the last week of the month so that is to be expected. Contracts accepted this week were up. 321 this week compared to 301 last week. Inventory going into next week is down with more contacts accepted this week and New listings down. Buyers have less to choose from. If you have been waiting to put your home on the market April is the month you want to have it on the market. Short sales were consistent this week. 7 this week compared to 6 last week. Now they will be submitted to the lender to see if they will also accept the contract as written. Sellers accepted contracts this week that are contingent on the buyers home closing. Buyers have accepted a contract on their current home but need to close before purchasing. 10 with a 72 hour kick-out clause, 12 with 48 hours and 6 with 24 hours. Contracts were also accepted by sellers that are contingent on the buyers current home selling and closing. Buyers current home might or might not already be on the market. They have not accepted a contract. It needs to sell and close before purchasing. 2 with a 72 hour kick-out clause, 11 with 48 hours and 1 with 24 hours. Our goal is to negotiate the price and terms that are best. We make it our business to find the perfect fit for your needs. Call us to do a market analysis on your home so you know what the value is in the current market. We will provide you with a net proceeds so you know the costs of selling your home. If you are thinking about purchasing, your first step is to call your loan officer to see what you qualify for. We will need the letter they provide to go with an offer when you find a home. It needs to be no more than 30 days old. Call us at 630-503-6555 Jeffery Szymczak-Broker ext 104, Bobby Burson-Broker ext 105 or Kristine Heiman-Managing Broker ext 101. We will answer any questions that you have. Find out about loans and the process. Take a look at current interest rates. See if you qualify for any down payment assistance. You might also want to take a look at school ratings. Market update Fox Valley-March 31 2018. Have a great week! Market Update Fox Valley March 17, 2018. Steady as she goes! This week there were 325 New Listings and last week there were 328. That is pretty consistent. Spring market has sprung! Closed listings this week were up. 187 closed this week compared to 111 last week. These numbers should go up as we head closer to the end of the month. Contract accepted by seller this week were also very consistent. 321 this week compared to 316 last week. This means the market continues to be strong. Buyers need to be on the ball and ready to go or they will miss out. Short Sales this week 9 compared to 12 last week. Now they will be submitted to the lender to see if they will also accept contract as written. Sellers accepted contracts that are contingent on the close of the buyers current home. The buyers have already accepted a contract on their current home but need to close before purchasing. 9 with a kick-out clause of 72 hours, 11 with 48 hours and 4 with 24 hours. Contract were also accepted by sellers that are contingent on the sale and close of the buyers current home. The buyers home might or might not already be on the market. They need to sell their current home and close before purchasing. 5 with a kick-out clause of 48 hours and 3 with 24 hours. The market is very busy. If you are thinking about buying a home you first need to get pre-approved with a lender so you know what price range you are qualified for. We need to present your pre-approval letter with an offer when you find the home you like. If it is more than 30 days old it needs to be updated. You might miss out on a home waiting for these so you need to be ready. Thinking about selling this year? Now is the best time of the year with the most buyers out there looking. Don’t miss out on the best market time of the year. Let us take a look at your home to see what needs to be done to get it market ready. Call us at 630-503-6555 Jeffery Szymczak-Broker ext 104, Bobby Burson-Broker ext 105 or Kristine Heiman-Managing Broker ext 101. You can also go to our website below to fill out a contact form if you would like us to get back to you. Check out down payment resource, current interest rates or loans and the process. If your credit score needs work talk to your loan officer. They can help you with what works best to bring your score up. The higher your score the better interest rate you will get. If you need names and phone numbers of loan officers. We can provide you with a few to contact so you can decide who you want to work with. 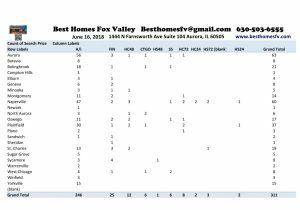 Market update Fox Valley March 17 2018. Have a great week! Let us know how we can help you or someone you know.